Mobile Phones Fan: Android Game Dev: "We Like Fragmentation"
Android Game Dev: "We Like Fragmentation"
That's right: at least one games developer likes Android fragmentation. First off, let's note that the following info (and images) came from Animoca, a Hong Kong developer of mobile apps for Android, iOS and other platforms. From a look at the website, their product portfolio consists mostly of inexpensive games. When it comes to the subject of 'fragmentation', that's a bold statement. It certainly is a refreshing change from the cynical hand-wringing we get from our tech press as well as the whinging we hear from a few (typically unsuccessful) devs. 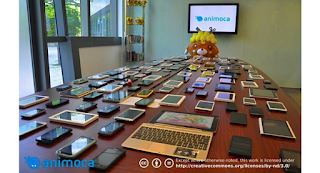 But the best part is that Animoca happily posted that photo to their corporate blog; it's not like Google dispatched Andy Rubin to squeeze a happy-talk press blurb out of them. So you have to wonder, what makes these guys so different? tl;dr: Animoca embrace Android fragmentation because it plays to their strengths, providing an edge over the competition and a steep barrier-to-entry for smaller firms. Like any games house, device compatibility is one of Animoca's biggest concerns. To that end, their QA department -- known to insiders as the "Bucket o' Droids" room -- tests (and re-re-tests) each product on a wide assortment of Android phones and tablets; some 400 different models, at last count. You're seeing a part of that stash in the title photo, carefully laid out across their conference room table. 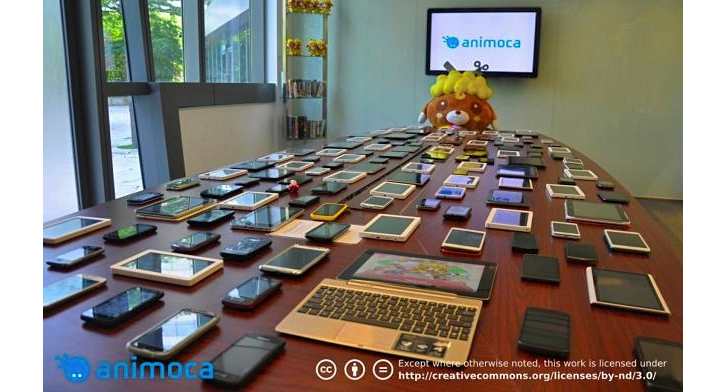 Seems to us the folks at Animoca are well atop the devices issue. Instead of complaining about the dreaded F-word, they figure out what has to be done...and then do it. Remember the 400 test-units they keep on hand for Quality Assurance? 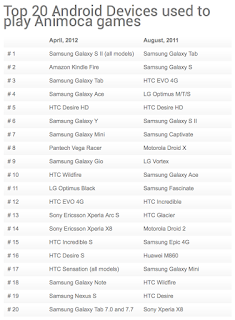 They note how their collection is missing some 200 further models -- these devices turned up in app activation records, but Animoca can't find examples to buy. 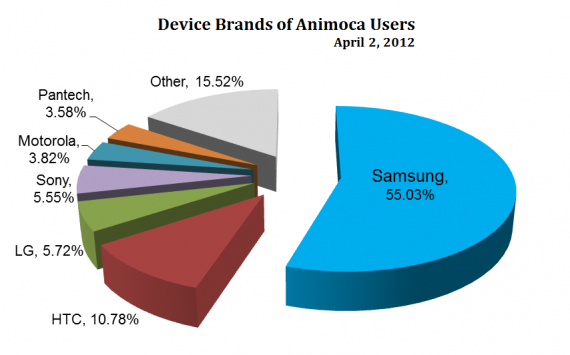 Of course, Animoca isn't representative of all Android developers. They have manpower and money for scrupulously rigorous testing that would drive smaller devs into receivership. But their example does prove that 'fragmentation' is both a curse and a blessing on the House of Android. It's part of the apps game; just one of many challenges to be overcome in the pursuit of mobile sector success. Ripped: Android Flipboard APK ...No Waiting! Offline 3D Maps Next for Android? Yahoo! Japan! Releases! Android! Browser! Have Fun with Windows Phone, Win a Prize! Is Comcast Cheating on FCC Net Neutrality Rules? Google Buys Gold's Gym...Revenge of the Nerds? UK Phone Boxes to Offer Free WiFi? No More Tweets from Windows Phone? Apple 3D Navigation App Replaces Google? Video History of Windows OS ...in 77 Min. Flipboard Updates Ripped Android App! Time Warner Cable CEO: 'What's AirPlay?" Does New Apple Patent Threaten Android ? Android Fragmentation: Bad or Worse? 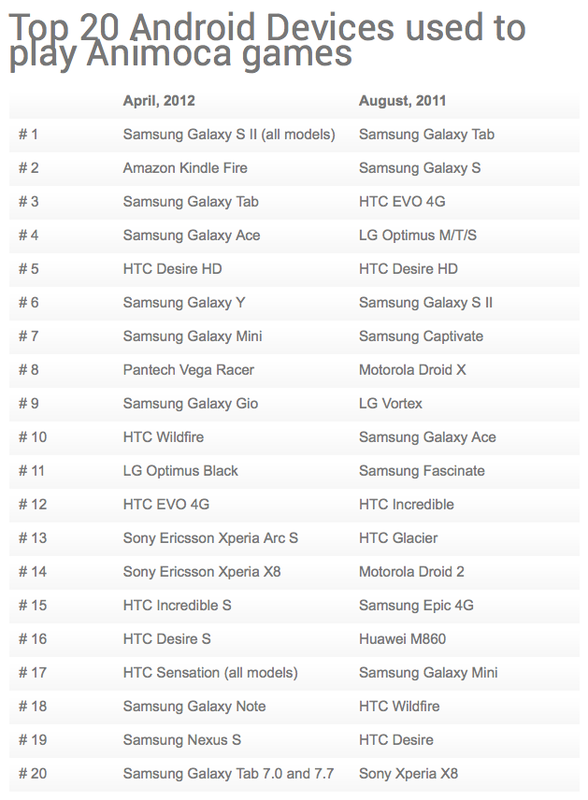 Samsung Galaxy S3: 9 million Pre-Orders?